He is back. Jose Mourinho stepped back into the coach’s seat five and a half years after he left. The airwaves have been thick with the story all day but appart from reporting that he has signed a four-year contract, there is little to actually say. Some have cautioned that returning to the scene is a risky business but most Chelsea fans have been hugely positive. The odd thing is that we all knew this was coming but suddenly everyone burst out in optimism and fervour anyway. Bring on the season. 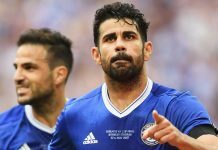 In an interview with Chelsea TV he addressed the issue of returning. He acknowledged the success he had already enjoyed here and added: “I want to start from ground zero, I need to work hard again and build a different team from the team I built in the past.” That should mean an interesting ride. Rui Faria, Silvino Louro and José Morais will join the backroom staff but Steve Holland, Christoph Lollichon and Chris Jones will all stay. Airdrieonians are back in the Scottish league. After a few years as Airdrie United the club announced the name change this afternoon. You see, everything is returning to how it should be – Mourinho is at Chelsea, Airdrieonians are back in Scotland and QPR are sliding down the divisions with crippling debt. Obi John and Kenneth Omeruo both played as Nigeria beat Kenya to take another step to the World Cup. A late winner means they top their group with two games to go. Victor Moses missed the match through injury. Group winners will all play off for the actual places in Brazil. It might lead to some surprises. England’s U21 team were beaten 1-0 by Italy. Stuart Pearce left Chalobah and McEachran on the bench until the second-half but in truth this Italy side were better all over the pitch. Meanwhile, Roberto Martinez picked up the Everton job, as everyone expected, and talked about strengthening, continuity, Champions League; all the usual guff. Michael Ballack’s testimonial saw Jose Mourinho manage a win for the world selection XI against a friends of Ballack XI. Michael swapped sides to play against his friends in the second-half. Andriy Shevchenko and Didier Drogba turned out for the world. Andre Schürrle played for the world as well and looks a handful going forward. Chelsea published the released and retained list today and a hefty few are going. The names of Benayoun and Malouda on the released list will surprise no one. Both Ross Turnbull and Hilario will be finding new clubs so we will need a new goalkeeper to back up Petr Cech. Unless Jamal Blackman has made the grade or John Terry fancies new role. Also leaving is Paulo Ferreira, who goes after nine years and with our thanks. Young players Aziz Deen-Conteh, Amin Affane and Nkumu Archange are also released with a good luck from us for the rest of your careers. Thibaut Courtois, Eden Hazard, Romelu Lukaku and Kevin De Bruyne all played a part in Belgium’s 2-1 win of Branislav Ivanovic’s Serbia. Kevin De Bruyne scored the opener. Meanwhile, Petr Cech secured a clean sheet as the Czech Republic held Italy. Contain your excitement the new away kit is here – yes, this time they have tried really hard… no, they haven’t… it is a plain white affair with a few unnecessary stripes one of which is red. You get the feeling that they don’t understand your average Chelsea fan or they all support Arsenal. At least – and for the first time in years – it is not black. England’s U21 side collapsed against Norway and bow out of the tournament. Perhaps now Stuart Pearce is out of contract the FA will choose a new manager who understands tactics. Just a hope. Nat Chalobah started but couldn’t do much to stop a rampant Norway. Michael Essien played his annual game of hope in Ghana and his African XI beat the World XI 4-2. Michael Ballack, Jody Morris, Ricardo Carvalho and Geremi all played but Jamal Blackman and Jeffrey Bruma probably had the most fun. Internationals rumble on as Oscar scored in Brazil’s 3-0 win against France. David Luiz also played. Mata, Torres and Azpilicueta all played as Spain beat Haiti 1-2. Kenneth Omeruo and Obi John Mikel are both in the Nigeria squad for the World Cup qualifier with Namibia and then on to the Confederations Cup in Brazil. Obi John, Ken and Juan, Cesar and Fernando will need a holiday after the competition finishes at the end of June. The organisers invited Tahiti to the Confederations Cup – we hate to think what Spain might do to them. Next articleWhat will Mourinho prioritise?